A generous selection of fine mahogany dining room tables and chairs can be found at AntiquePurveyor.com. Here, you will find more variety, high end quality, discounted prices, generous inventory and unbeatable service by an owner operated team of professionals. 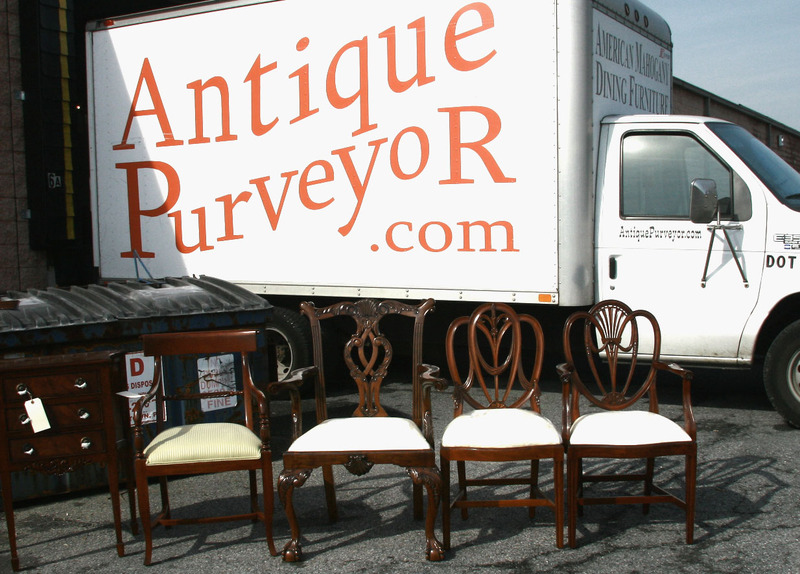 AntiquePurveyor.com is a fine antique reproduction furniture specialist with a generous inventory of mahogany dining tables and chairs. Our most popular selling items are in stock and ready to go with little or no ordering time. Most of the mahogany dining tables here will be Duncan Phyfe double pedestal style tables. To view our line of fine furniture, just reference our main navigation and browse by category. Hi, I'm Donald Timpanaro, owner of AntiquePurveyor. Here's a bit about me and how AntiquePurveyor started. I live in Brookfield, CT with my wife and 2 daughters. I grew up on Long Island. I went to school for finance and business, and when I graduated I started an aquarium business. I loved the business aspect of it, and discuvered that I loved the design aspect of it. Wanting to get back into finance, I took my series 7 and spent the next few years trading equities in the Over The Counter (OTC) market. After the stock market dive of 2000 and the ensuing recession, there was little money to be made in the finance industry and I figured it was time for a change. The job market had become dismal and starting a new career in this environment seemed impossible. We were living in Hoboken, NJ and were planning to move, so we had an estate sale. Flag-size plywood signs were used to attract traffic from every corner of the busy town. My wife and I sold $3,000 worth of older furniture that weekend. How cool is that? So for fun, we started shopping at auctions and garage sales to get more furniture to sell. I was trading again; buying anything I thought was under-priced and could be sold at a profit. Our fun passtime started to turn into a business. "Garage sales" were my main source of product and holding estate sales once a month became my main outlet for selling. It was a great time until the traffic and volume got to be too much in my living space. It was time for a small warehouse and a new advertising campaign. My first warehouse space measured 800 square feet and I remember the overhead scared me to death. I needed more product and cleaner product as time went on to cover my costs. I shopped at auctions to find product faster and rather than posting garage sale signs on each corner, I started selling my items on eBay. I did the auction gig for years. It was hard work and very long hours. Then, I received an email from a former Drexel plant manager who found one of my tables on eBay. He recognized the table from a 1990 factory that he once managed. This gentleman helped me network in a way I had never imagined. His short email became the start of what AntiquePurveyor.com is today, a dining room furniture specialist. I've done well by always putting the needs of my customers first over the years, as demonstrated by my eBay feedback record of 99.4% customer satisfaction. I have learned from past experiences, both buying and selling, what is expected and what is certainly not deserved. I try to be available 24/7 to answer questions and provide exceptional customer service. I have many repeat buyers and I enjoy serving everyone. It's been said that '"The only ones who go to work happy are those who have the right tools for the job," and I completely agree. I and fully equipped to making shopping on-line for your fine furniture needs an easy and satisfying experience. 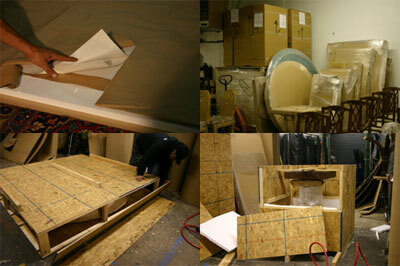 I have a local delivery truck, clean warehouse space, furniture dollies, racking, plus plenty of packing materials. 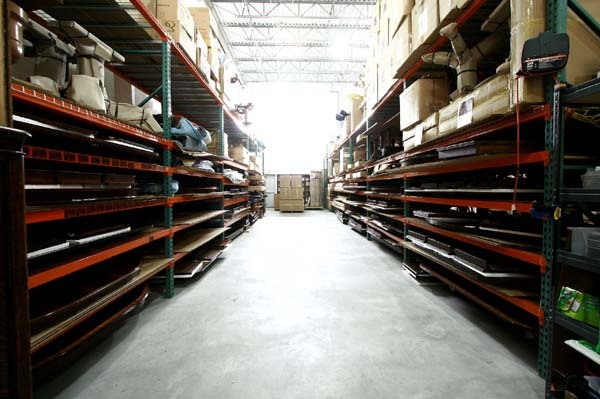 We have steel racking for our entire product line so everything is highly organized and furniture is not double-handled. We also have a cost effective warehouse which ensures our prices stay below the competition. In actuality, we function very much like Amazon.com - but we sell very BIG books. 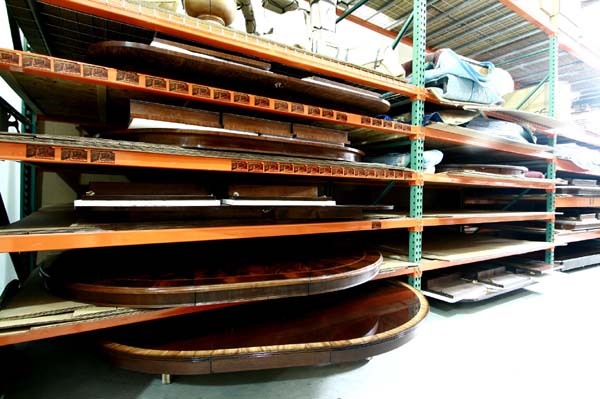 Pictured below, our extra large dining tables, large dining room tables, oversized tables, mahogany dining room tables, and fine and fancy high end dining tables of all types are well-organized and safely stored on steel racks. 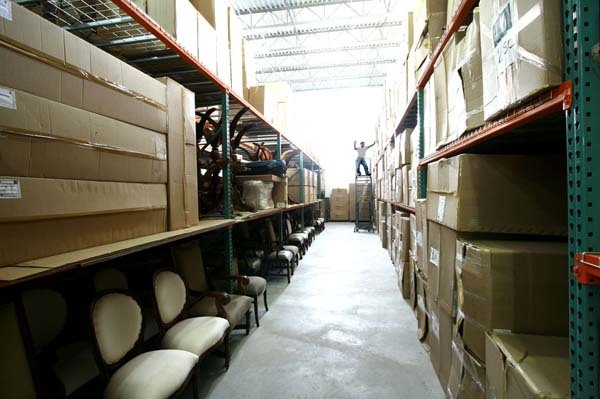 Our warehouse is large, clean, highly organized and able to maintain plenty of inventory, all of which helps us keep our fine furniture prices fair, reasonable and well below the competition at all times. 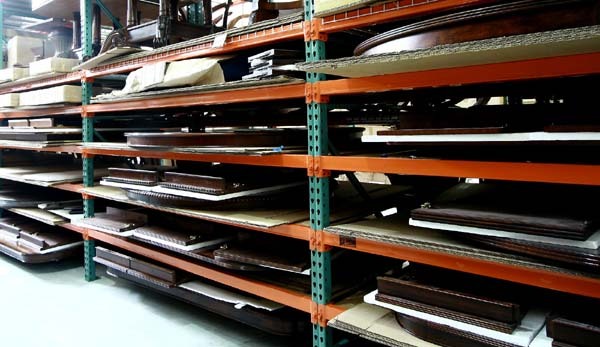 As you can see in the photo below, our fine furniture is boxed and stored with floor models positioned beneath each product so that once packed, merchandise such as our upholstered dining chairs, mahogany shield back chairs, Chippendale chairs, luxury chairs and antique dining chairs rarely need to be handled again. As you can see below, we have our own truck for local deliveries. This allows us to ensure white glove treatment of any local order ranging from mahogany dining room tables and shield back dining chairs to conference room tables, American made and fine imported furniture .